A few weeks back I invited my friend Nick over for dinner. In exchange he got the lovely job of putting up my curtain rod. A perfect exchange if you ask me. Just before he arrived I started cooking and was about to blitz the floors with the vacuum cleaner but it refused to even come to life, so I had to open the door with dusty floors. Maybe not a big deal to some people, but it is to me. I like things to be nice, and most of the time as nice as possible. But I thought to myself, maybe I can distract him from noticing the dust in the corners if I cook something really good. As it turns out I did. 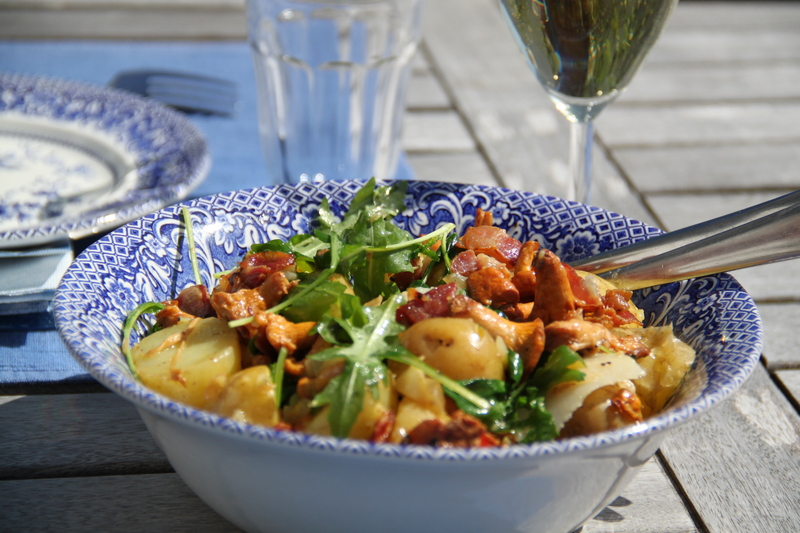 It is a very simple recipe, and pork fillet is a cut we use A LOT in Sweden. Less so here, and although I like other parts of the pig, this is a very versatile cut and I always go back to it now and then. Fry the mushrooms on high heat in a large frying pan, in butter and olive oil. Remove when properly browned, add salt and pepper. Add the bacon to the same pan and fry until crisp. Remove. Brown the pork on high heat and remove as well. Add the wine and let half of it bubble away. Add the cream and creme fraiche and let it bubble for a few minutes. Add the mustard, stock, soy sauce and sauce colouring. Adjust the seasoning. Add the mushrooms, bacon and pork and let it cook for about 10 minutes or until the meat is cooked through. 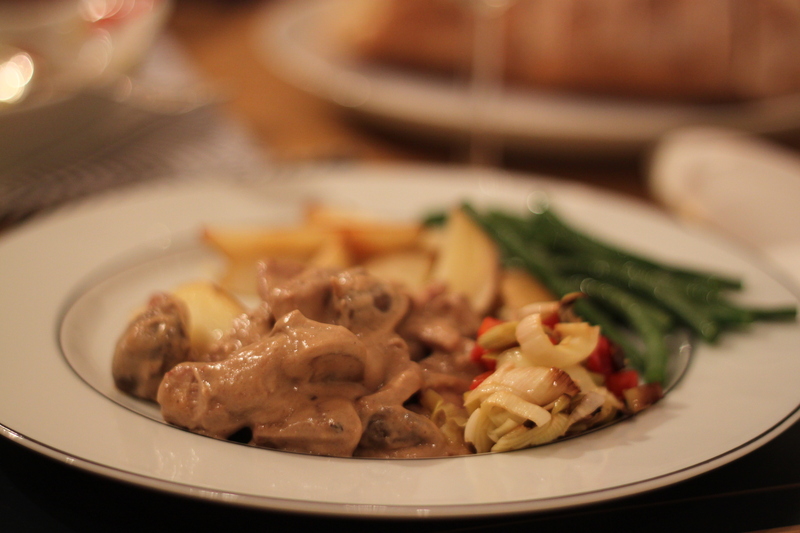 Serve with potato wedges and any vegetables you like. I served it with crunchy green beens and soft leek and peppers that I cooked in the oven in some olive oil. This is a great throw-together starter, that still has that something extra. Just serve with some nice bread. I know that wild garlic is not in season now, but I happen to have quite a lot of it in the freezer, so I can use it for special occasions. I totally adore the flavour! Make the mayonnaise. Cut the bacon into smaller pieces and fry until crispy. Drain on kitchen towel. Dress the salad with oil and salt. 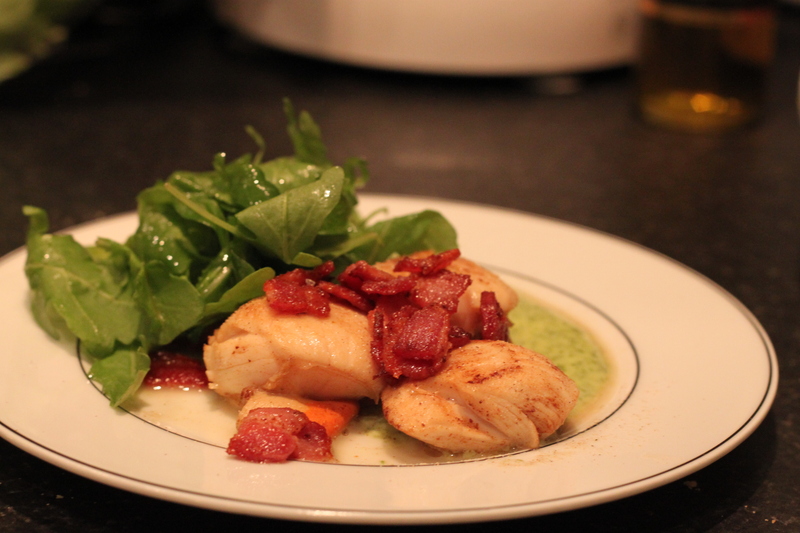 Cut off the muscles on the scallops (the tough white part) and fry in butter on high heat until just cooked through. Season. Plate and serve straight away. A long breakfast or brunch is the best way to start the weekend, isn’t it?! 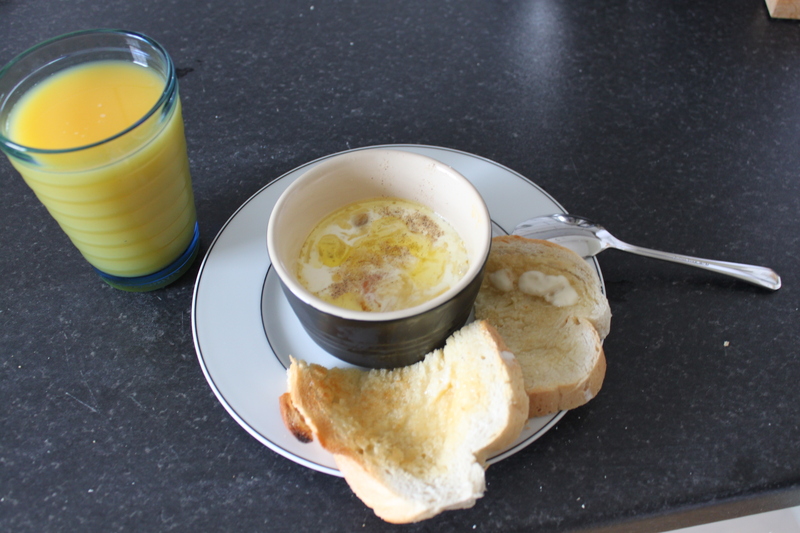 A favourite dish of mine for such occassions is oeufs en cocotte; a baked egg with cream in a ramekin. I have mentioned about these little darlings before, but thought it was time again now since I last weekend had the perfect egg. Not yet set, with cheese, bacon and truffle oil it was such a delight. I also, finally, figured out the perfect time and setting for my temperamental oven. Horay! Grease a ramekin. Place the fried bacon in the bottom and break the egg on top. Pour over the cream, sprinkle the cheese, drizzle truffle oil and add some pepper. 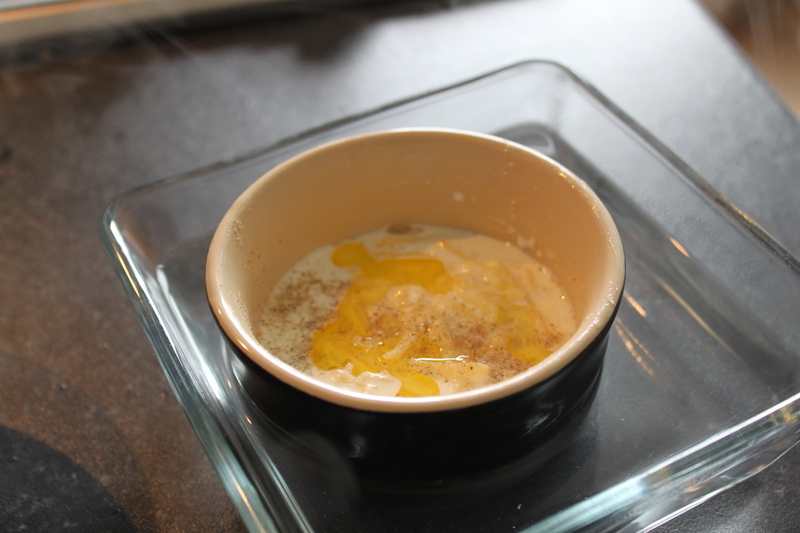 Place in a ovenproof dish and fill it half up to the ramekin with boiling water. Place in 160-180 C oven (depending on the oven, mine was perfect at 160C) and bake for 14-16 minutes, longer if you need the egg to set. Eat with a spoon and a piece of buttered toast, and roll on Saturday night!